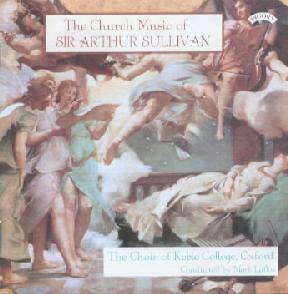 This CD presents fifteen examples of Sullivan's music for the church. The notes claim that eight of them receive their first recording, and four others their first recording on CD. I have to admit a good deal of ignorance about this type of music, and much of it went past my ears under-appreciated. Seventy-seven minutes of unremitted choir and organ is too much for my taste. In fairness to Sullivan, these pieces were not meant to be sung in a single performance, and perhaps doing so here robs them of their individuality. The logic behind the order of the selections is not clear: it is neither chronological nor thematic. Several times whilst listening, I felt that a musical climax had been reached — a "Grand Amen," if you will — and the next number seemed an anti-climax. All told, I would have preferred a chronological ordering, as it would at least have given one the chance to trace the progress of Sullivan's development as a church composer during a formative period of his career (most of the items being from the pre-Gilbert days). The enclosed notes by William Parry are thorough and informative. Parry writes about as strong a defense of Sullivan's broad achievement as has been offered to date. Regrettably, he claims that "almost no one" besides David Eden has "done justice" to an analysis of Sullivan's character — surely a gross exaggeration. The notes also provide the words for all the pieces. Parry provides a full discussion of how each piece fits in Sullivan's career. But Parry's treatment is in the order the pieces were written. This is not the order on the CD, so again the listener is somewhat frustrated by the arrangement. The choral singing seems first-rate, though perhaps there should have been a few more singers, as one could pick out individual voices at times. This CD offers an excellent selection, mostly of Sullivan's anthems. The Keble College Choir has a fresh and vibrant sound, and the chapel, where the CD was recorded, is well suited to the music. Six of the anthems receive their first recordings, as do the Te Deum and Jubilate in D. The latter two are extremely interesting, and it's disappointing that the Kyrie which completes the set was omitted. It seems odd that it could not be fitted in at the expense of, for instance, the Martyr excerpts, which have already been recorded. This CD demonstrates (if demonstration were needed) that Sullivan's church music is very valuable, and worthy of reappraisal. It also makes a good complement to That Glorious Song of Old. Many of the works included on this CD are receiving their first recorded performances, and those of us interested in Sullivan's compositions other than the Savoy Operas must be extremely grateful to Priory and the Sir Arthur Sullivan Society for making these recordings available. For too long Sullivan's contribution to church music has been written off by critics who have suggested that Sullivan the church composer lacks the vitality and originality of the Sullivan of the Savoy. Item after item on this disc shows Sullivan's church music to be "full of striking harmony" and "bursting with melody" as William Parry writes in the accompanying booklet. Just listen to the charming waltz tune which forms the central section of "O God, Thou art worthy to be praised" or the opening section of "Sing, O Heavens" and you will see what he means. Sullivan is generally content for his organ accompaniments to support the singers rather than making a distinct contribution of their own — which is in keeping with reports of his own style of organ playing which was described as "eminently legato and quiet, and scrupulously in keeping with the general feeling of the words; but when occasion required, the louder portions of the instrument would gradually be drawn upon for a well conceived climax." These words could equally well apply to Gavin Plumley's contribution to this new recording. The choir of Keble College is a mixed choir, but the sopranos produce a tone reminiscent of boys' voices even if a direct comparison reveals a difference between them and the genuine article. They are recorded in an acoustic with sufficient reverberation to give appropriate atmosphere to the sound without clouding their diction or blurring the harmonies. The voices are well balanced and Mark Laflin judges the tempi admirably. This is brought out in two of the three items which have been previously recorded on CD by Ely Cathedral Choir on Cantoris Records. In "Yea, though I walk" from The Light of the World, the greater resonance and the slower tempo on the earlier recording means that the piece has less impact than on the new recording, whilst Ely's faster tempo in the opening and closing sections of "The Strain Upraise" seems unduly rushed compared with the new recording. However, Lafkin's tempo in the opening of "Sing, O Heavens" seems rather slower than the required crotchet=104. Incidentally, Sullivan's setting of the words "With Alleluia evermore, The Son and Spirit we adore" are distinctly reminiscent of his setting of the lines "Select a pretty site for it, This spot is suited quite for it" in the chorus "When anger spreads his wing" from Act III of Princess Ida.